I watched his show as a professional speaker. I'm someone who knows what it's like to be given a stage for an hour or more. I know the feeling of walking out in front of more than 1,000 people. It is an incredible gift to be given a stage. People take time out of their day to hear what you have to say (and sometimes pay money too). The gift of an audience should never be taken lightly. Once you're given a stage, you need to deliver. It is not easy. I see a lot of bad presentations on the speaking circuit. Bestselling authors who think they deserve the stage and do not craft a speech. CEOs who talk incessantly about their company’s stupid products. An Olympian who thinks showing a few video clips from the race is enough. 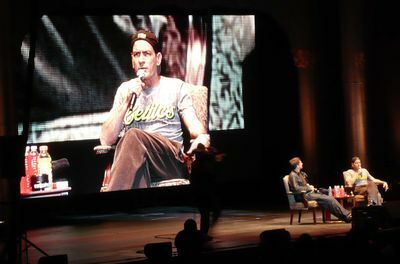 What would Charlie Sheen do with his stage? Sheen could have gone the standup comedy route but he did not. Sheen could have gone the professional speaker route and delivered a well-crafted speech with a story arc while providing his audience with motivation to act. But he did not. Sheen sort of hosted a variety show. It sort of worked in places. In others it fell flat. It worked best when Charlie Sheen was being Charlie Sheen. He led off by coming out from the back of the room boxer style, with security around him. The entire audience was on its feet. This was a good opener. He delivered his now famous one-liners often, throwing "Winning" "Tiger Blood" and "Trolls" around a lot. This was good because it got the audience on his side. Give 'em what they want. Early on, he turned his TelePrompTer around so we could see it. (It displayed "How do you like Boston?") He then went on a mini-rant about how "These TelePrompTers are the electronic tools of trolls." I thought that was hysterical. "How do you guys feel to be on the drug called Charlie Sheen – Now you know what I feel like! I'm like this all the time!" This line got a cheer. He lost much of the audience when he spent about 20 minutes hosting a "contest" to find "the third goddess" to add to his harem. A dozen women were invited up on stage (I think at least three were plants). Each had a short moment with the man himself as he asked why she should be goddess number 3. The audience voted by cheering who was the best. The intermission was fascinating. 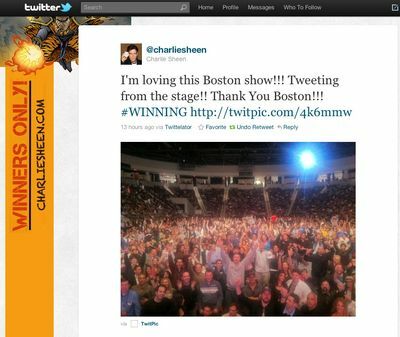 His YouTube video Charlie Sheen: The Unedited Version played on the big screen. It was kinda cool actually – the virtual Charlie Sheen in the form of his own YouTube video serving as entertainment during the intermission to his live show. Fortunately the video and the intermission were short. The second half dragged because Sheen took a series of inane questions from the audience. As any professional speaker knows, when you open it up for questions, people can say anything. Rather than "dealing with the question" as a politician would and just riffing in any way he wants, he actually tried to answer the dumb questions. I did like how he took a photo of the audience and had a helper tweet it out live. Nice. As a standup artist, Charlie Sheen stinks. As a motivational speaker, Charlie Sheen stinks even more. As the host of a variety show, Charlie sheen is terrible. But Charlie Sheen is damned good at being Charlie Sheen and that's what I paid for so I was satisfied. I’m glad I went. I'm convinced that Sheen is enjoying himself immensely during this process. He has the media hanging on his every word and millions of supporters. So who is #Winning?